All our aesthetic treatments are performed by a RGN nurse with over 10 years experience and include a complementary no obligation consultation, treatment and follow up consultation/review. Dermal fillers using Juverderm, Teosyal or Restylane. Botulinum toxin muscle relaxants commonly referred to as Botox. If you would like more information and pricing, please contact the salon. 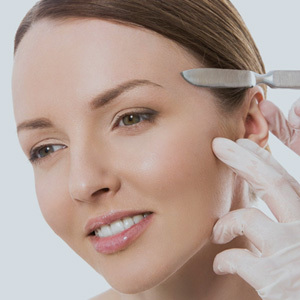 Dermaplaning is a deep exfoliating treatment that removes 2 -3 weeks worth of dead skin cells and surface debris it will also remove vellus (peach fuzz) hair. Results are immediate so it is a fantastic treatment to be done a few days before a special occasion as you skin is left radiant and silky smooth. The treatment involves gently moving a surgical blade over the skin thus removing the dead skin cells and vellus hair(peach fuzz), we will then apply an enzyme peel to brighten your skin and finish off this amazing treatment with a calming and deeply nourishing face mask the whole treatment takes 1 hour to do and is recommended every 4 weeks. The CACI facial is the Ultimate in none surgical face lifts! Targeting all 32 muscles in the face it uses microcurrent to re-educate and lift facial contours. A course of 10 facials over a period of 4 weeks is recommended for maximum long term results with maintenance facials every 4 to 6 weeks. 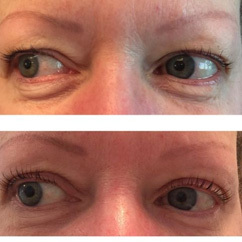 Results are visible after one treatment. However, for maximum and more permanent results a course of 10 treatments are recommended over 4 weeks. Lifts and tones all 32 facial muscles and neck area, whilst improving skins elasticity and reducing appearance of fine lines. The NEW CACI Eye Revive treatment is a must-have treatment for anyone concerned with ageing and puffiness around the delicate eye area. The gentle 30 minute treatment soothes tired, puffy eyes, combats dark circles, reduces fine lines and wrinkles and lifts hooded eyes. The treatment uses serum filled CACI microcurrent eye rollers which have a cooling effect on the skin to gently tighten and tone sagging muscles around the eye area, whilst reducing the appearance of fine lines and wrinkles. The microcurrent eye rollers are infused with CACI Eye Revive serum which contains REGU®-AGE and other clinically effective ingredients to reduce puffiness by up to 31%* and dark circles up to 35%* - The deeply nourishing Hydro Eye Mask is then applied to soothe and calm the skin. The Hydro Eye Mask is packed full of rejuvenating properties to detoxify, reduce puffiness and nourish the skin. Use as part of your everyday eye care routine or in-between salon treatments to further enhance your results. Suitable for all skin types, the CACI Eye Revive treatment has been created using clinically effective products that deliver impressive results, to keep you looking refreshed and revived. The Eye revive treatment can also be added to your CACI Ultimate facial. The Ultimate CACI builds upon the Classic's success not only are we able to contour and lift the face, the Ultimate allows us to do so much more! It includes all the benefits of the Classic CACI, with the option off adding some ultimate additions. You can choose to add on 1, 2, 3 or all 4 additions depending on your skins needs. Wrinkle Comb - Uses LED Light therapy & microcurrent to stimulate collagen production, reducing wrinkle depth, encouraging tissue repair & healing. Hydratone Mask - Deeply Nourishes and quenches the skin with collagen, hyaluronic acid and rose water, leaving the skin soft and radiant. Jowl Lift - Improves the appearance of sagging jowls by using quad probes that emit electrical impulses to lift, firm and redefine. Ultimate CACI Pay for 4 get 5th one free. Working intensively on just the jowl area to lift and tone, followed by the wrinkle comb to plump out fine lines and wrinkles. Extra Ultimate additions may be added for a more intensive treatment. For congested skin prone to breakouts, Microdermabrasion deeply exfoliates followed by steam and extraction of blackheads. Then the skin is calmed and healed with LED light therapy. For treatment of deep lines and wrinkles, Microdermabrasion is used to smooth and brighten. The wrinkle comb then plumps deep lines and stimulates tissue repair before finally lymphatic drainage massage is used to reduce puffiness and the hydratone mask quenches the skin. Leaving a more youthful complexion. All CACI treatments can be purchased as a course on a pay for 4 get a 5th one free. The ECM attachment combines the therapeutic benefits of massage with the effectiveness of microcurrent therapy. The unique design of the Electro Cellulite Massager utilizes twenty four conductive rollers electrically charged with microcurrent to gently knead and firm sagging muscles. Cellulite is the term used to describe pockets of fat which are trapped and cause dimpling in the skin. This lumpy dimpling is irregular and patchy and is often compared to the appearance of orange peel or cottage cheese. 80% of post-adolescent women go on to develop cellulite at some time during their life although it is very hardly ever seen in men. The thighs, buttocks and the abdomen are the most common areas for a woman to develop cellulite. Although it is often mistaken for obesity, cellulite is not actually obesity related because it can also take place in thin lean women. Underneath the dermis and epidermis are three specific layers of fat. Cellulite tends to develop in the subcutaneous fat layers. This layer of fat is unique in its structure compared to the other layers because its fatty parts are structured into specific chambers by strands of linked tissue around it. To treat cellulite it is necessary to stimulate the area in order to reduce the volume of fat that has become stored and to kick start the blood flow and circulation which has become metabolically sluggish.